Captain Jack Sparrow. By now most of us have probably seen the Pirates of the Caribbean movies, some, like me, have seen them several times. Nevertheless, let me remind you of a couple things about Captain Jack. First he’s a pirate, and he loves being a pirate, he often does things that suit him and his interests. When the story finishes, and he has done the right thing, he has basically gotten him what he wanted all along! Is Captain Jack Sparrow a good guy or not? Or is he more of a neutral guy who often appears to do good things? Isn’t Captain Jack often the hero we almost want to hate? Doesn’t that humanity make him more realistic? Along with all of this, the fact remains: Captain Jack is a pirate, when you have a pirate as the hero aren’t you bound to hit a few bumps along the way? This is how we often want our heroes to appear; overall they are good but always human and prone to making mistakes, and, well, prone to being human. This is the human story, isn’t it? We both want to do the things we want to do and look and feel as if we are being good at the same time. Not to overuse the Hollywood imagery but I cannot help but think of a huge celebrity giving away a lot of money to charity. These celebrities give a lot of money at times, but don’t we always know that they are giving from their excess? What they give doesn’t hurt them; they get to both look good and keep living the life that they want to live. On a much smaller scale I know I do pretty much the same thing, I want it both ways: I want to live the way I want and have people think I’m doing what is good. Oh humanity you never cease to amaze me with your complex beauty and idiosyncrasies! We have a similar problem in today’s readings. The first line of the first reading: The Lord is a God of Justice! I don’t know about you, but when I hear something like that a part of me starts to think oh boy someone’s about to get it! Jesus, typical Jesus, he won’t let our normal expectations come true – he has to go and flip things on their heads. I’m not sure if it’s obvious, but the bad guy makes it out of the Gospel looking pretty good, and the good guy starts to look pretty bad. We might be too used to thinking of the Pharisees as the bad guys. It good to be reminded that they were the religious leaders of their time; they followed the Law of Moses so closely it was almost disheartening to think how can they be so good at following all these minute details? For most people at that time, the Pharisees made you look bad, and the tax collectors, well he typically would make you look pretty good. Now these guys weren't just your average IRS agent. The IRS gets paid to do their job, and there is supposed to be a fair amount of oversight to make sure they do their job fairly. 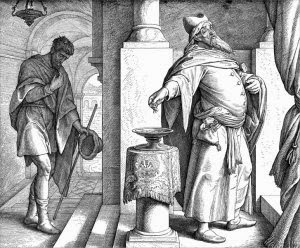 The tax collectors of biblical times were far from being IRS agents. These tax collectors paid the Roman Empire for the privilege to collect taxes in a certain area. They calculated how much the Empire wanted, against what they thought they could get people to pay, and then they had to outbid the competition. All these calculations, in the end, just drove up the amount they had to take from the people. These people were organized crime sanctioned by the government. On top of that they were sellouts – in this area of the Empire they typically would have been Jews who decided that they wanted money more than the respect of their neighbors and friends. Someone from God’s chosen people decided that being chosen was not good enough for them; nope, they’d rather have their Imperial friends and a lot of money. Sounds like a person that would be easy to dislike, just a little. Ah but there it is: the simple fact that the tax collector went home justified and not the Pharisee. As a religious leader, this gets my attention, and I think that is the point, Jesus wants our attention! I’d like you to imagine for a moment two children, two little boys. One of the little boys LOVES to tell on his brother. He is constantly running to their dad yelling ‘daddy, daddy, look what Tommy did!’ Now it is true, Tommy is often in trouble: climbing trees, breaking toys, getting into mom and dad’s things, scaring their sister; anything and everything that Tommy can get into, Tommy finds a way. John, on the other hand, hardly ever gets into trouble, mostly because he seems to be constantly watching Tommy and what he’ll get into next. I wonder if we might not see the actions of both children as two children looking for the attention of their father in two very different ways. Which child do you think the father loves more? There is no secret to this father, he loves both of his children very much, he loves Tommy because he reminds him of all the trouble he used to get into as a child, and he loves John because he reminds him of all the trouble he used to get into as a child. Now John gets Tommy in trouble, again, and Tommy comes crying to his father saying he is sorry, like he always does, and he promises to behave, which he’ll do – for a while. All the while John is standing there with that smirk on his face. That smirk, however, quickly turns into a frown when the father tells both his children to go play together out in the yard. I’d say Tommy is the one who goes away justified. They both came before their father asking for something. It is Tommy, however, who is the one who walked away having received what he asked for. He asked for mercy, and he received it. Notice too that Tommy does not leave without some form of penance – he is told to go play with John, his brother who got him in trouble. Playing together Tommy might be kept out of the most serious and dangerous kinds of mischief and John might learn to loosen up a bit. Switching gears a bit I’d like to talk about hope. It is important to point out that the virtue of Hope, like all virtues, exists between two vices. In this way, Hope exists in the middle between the vices of despair and presumption. One can say that these vices represent having too little hope, and too much hope, at least too much of what might sound like Hope. We do not get despair in these readings today. Instead we get a lot of people crying out to God, and we get a few people standing there expecting to get what they think they deserve. The people who are presumptuous think that they know the answer; they think they already have everything they need. I pray that we avoid such presumption, pray that we avoid such arrogance! Those people who cry out to God are true people of Hope! They are people who have not given up on crying out for mercy because they have Hope that the almighty God will hear their cries, as pitiful as they are. They cry out in Hope, because of Hope. We cannot presume that we will have salvation, like the Pharisee; nor can we presume that we are the MOST loved son, like John in our story. We cannot be presumptuous in matters such as these. We cannot be presumptuous and still be truly honest with ourselves; we cannot do this any more than we can presume that Captain Jack Sparrow will do the right thing! Captain Jack is a pirate, and we are all sinners; we are all sinners in need of God’s mercy. In the words of the justified tax collector: ‘O God, be merciful to me a sinner!’ It may sound ridiculous, but we can hope to be the tax collector. It would have sounded strange to Luke’s audience too, but that is what we can hope for. Did the tax collector go home and get rid of all the wealth he had accumulated through cheating people? It is possible, and I think that it is what we are called to imagine. Even if this is not the case, however, the tax collector walked away justified that he would be shown mercy, and he was shown mercy, for we are told that he was justified. How many times already in this Mass have we asked for God’s mercy? We have prayed six times, six times already that God be merciful on us! Three of these times were at the penitential rite, at the beginning of Mass, and the other three were in the Gloria. We also had father pray that God hear our pray and grant us the mercy that we asked. Were you paying attention? Did you ask for mercy the way the tax collector asked for mercy? Sister and brothers, the Good News that we are invited to hear today is that we are the tax collector, and even we are justified in calling out to our God for mercy. 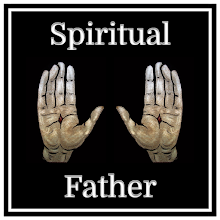 Our God, our Father, he loves us all more than we can ever fathom, and we call out for mercy knowing that we are sinners, and he grants us that which we truly seek which is communion with Him. Please help me improve! 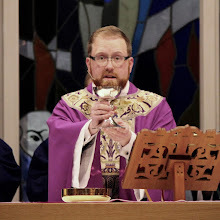 Evaluate this Homily by clicking here!